Breaking Through With Georgiann » Blog Archive » Are You Gorgeously Green? Sophie Uliano is a passionate environmentalist and who has developed an earth-friendly lifestyle that appeals to women who don’t want to compromise their glamor and style. 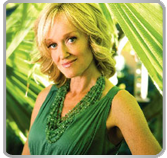 She is the New York Times Best Selling author of the new book, “Gorgeously Green”, by Harper Collins Publishers. Sophie’s upbeat and practical approach guides thousands of style-conscious women through the simple steps that they can take to become more aware of their impact on the earth. She shows women how to update their beauty regimen, create an eco-friendly home, adopt a healthier diet and fitness routine, indulge in guilt-free shopping, and more. Join Georgiann and Sophie for some “Green Girl” talk about Gorgeously Green and Sophie’s latest book, The Gorgeously Green Diet. For more information, click here to visit Sophie’s website.